Fighting Trumpism: where do we go from here? It’s been two weeks since Donald Trump’s inauguration sparked some of the largest rallies in American history. Each week since has also seen demonstrations, culminating in those that broke out at airports across the country at the end of January to protest the president’s new Muslim ban barring travel from seven predominantly Muslim countries. Mass protests are in large measure a bellwether of popular sentiment. They carry an implicit threat that politicians who defy the will of the people will be voted out, but that threat must be channeled strategically, or it will dissipate. 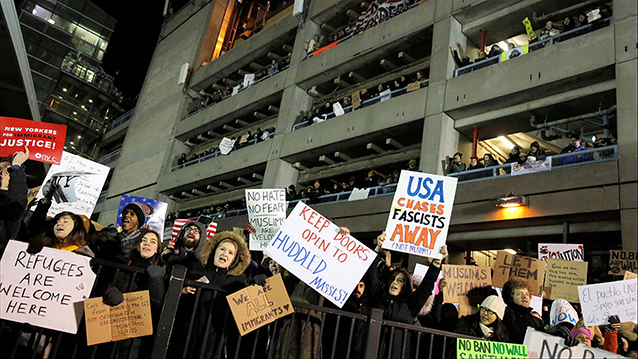 Thousands protested Trump’s “Muslim ban” by occupying airport terminals. The Clinton campaign and its most strident defenders continue to point the finger at everyone but themselves for our country’s current predicament. On the left, however, a general consensus has emerged: It was the campaign’s own elitism, not the bigotry of the white working class, that led to Clinton’s loss. Yes, bigotry played a tremendous role, but it was a bigotry driven by desperation and anger at a system that has left so many behind–and that Donald Trump expertly manipulated. The emerging resistance must reach out not only to liberals but also working-class Trump supporters. We cannot afford to accept that roughly 62 million Trump supporters are irredeemably bigoted because, if we do, there is no hope. Culture and emotion come into the mix but our politics–the politics of the left and of the labor movement–are ultimately predicated on the belief that people are rational actors, that they act in what they believe to be their own best interest and that they can be swayed by rational argument. Therein lies one of our most basic but most important tasks. That’s what we need to do now–and, as every organizer knows, conversation is the heart of organizing. It’s not as romantic as civil disobedience or building rallies and may even be downright unpleasant, but it’s necessary. Whether we are talking to liberals or Trump voters, the key is to speak and listen with an open mind and without making snide remarks about the Clinton campaign and assertions that Bernie would have won or hurling accusations of bigotry at Trump supporters. Instead, let’s take a conciliatory tone and focus on the issues at hand: the elitism inherent in liberalism as an ideology that has brought us to this point when speaking to liberals and the common interests that downwardly mobile whites have with people of color when speaking to Trump supporters. We need to use these conservations not just to change people’s views but to move them to action. But what action? Attending rallies is important; so too can be symbolic actions like wearing a safety pin to demonstrate your commitment to defending your neighbors from harassment–and then acting on that commitment. But these actions, on their own, are not enough. In some cases, they do more to assuage white guilt than challenge the power structure. Racism in America is systemic and requires a systemic response. Defending someone on a bus or subway or on the street doesn’t change the fact that they’ll still face other subtler forms of discrimination and more blatant structural ones, including threats of mass surveillance or deportation. Indeed, too many already do. Nor does punching fascists prevent them from spreading their ugly views that are now seeping into government policy. We need to push for collective and not just individual responses, and the unions are the perfect vehicle. Even in their weakened state they still retain tremendous power; they also have a lot to lose. Stephen Lerner and Maurice Weeks suggest in The Nation that “the challenge before us is to make life in Trump’s America unbearable for the newly enshrined and empowered billionaire class” and that the unions can help by organizing workers at the companies these billionaires own and divesting workers’ pension money from their hedge funds and private equity firms. These are great ideas. But that doesn’t mean the labor movement will run with them. Past experience shows that they’re just as likely to respond to the Republicans’ ascendancy by pouring tremendous sums of money into the 2018 and 2020 elections. Just consider the experience of both John Sweeney’s New Voice leadership at the AFL-CIO in the 1990s and Andy Stern’s breakaway Change to Win Federation in the 2000s, both of which promised to ramp up organizing and instead continued to throw money hand over fist at the Democrats. Most unions, at the end of the day, just don’t know what else to do anymore. Beefing up political action–including involvement in elections–isn’t necessarily the wrong response to what is, after all, a political crisis. The question is how not whether the unions will intervene in the electoral arena. The vast majority of them endorsed Clinton in the primary and it is painfully clear that, absent tremendous pressure from below, they are likely to stick with the party establishment. It’s up to rank-and-file union members to see that they don’t. That means collecting petitions and raising motions at union meetings that commit the unions not just to fighting Trump but also to moving away from the Democratic establishment. If there was ever a moment when they might, it’s now; but without this pressure from below, they most certainly won’t. Whatever the unions do, they will probably be doing it with less: Already the Service Employees have announced plans to cut their budget by 30 percent over the next year in anticipation of renewed attacks on their dues base. Activists sit in at Chuck Schumer’s office after the election. 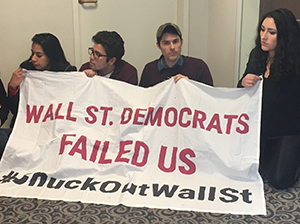 Their banner reads “Wall St Democrats Failed Us #ChuckOutWallSt”. We also need to channel the energy of mass rallies into more targeted efforts to turn up the heat on recalcitrant Democratic politicians at the local, state, and national levels. Petition, email, and call-in campaigns are all underway, but we need more. We also need more actions like the sit-in at Sen. Chuck Schumer’s Washington office by #AllOfUs–a group comprising veterans of Occupy Wall Street, Black Lives Matter, the environmental movement, and the Sanders campaign–that took place shortly after the election, and the ongoing #ResistTrumpTuesdays that in New York have also frequently targeted Schumer, albeit in much milder fashion. The “Indivisible” guide is chock full of similar ideas—some drawn from the Tea Party playbook–about how to pressure legislators. Many groups are already running with these ideas. It’s about time that the unions also take a swing at Democrats who might collaborate–or who already have. (Similar actions have also targeted Goldman Sachs and other corporate Trump backers. Striking workers at the Momentive factory in upstate New York, for example, have succeeded in linking their fight with the anti-Trump movement by focusing their fire on investor Stephen Schwarzman, Trump’s “jobs czar,” who until recently was a partial owner in the company). Whatever we may think of efforts to reform the Democrats, they are the frontline in Congress against the Trump administration, and they need to be pushed to fight Trumpism by abandoning Clintonism and instead offering an alternative, expansive vision of free public higher education, single-payer health insurance, infrastructure spending, higher wages, cheaper housing, and more generous Social Security. It’s not enough to hold the line against the worst of Trump’s policies or try to block his most heinous appointments; the Democrats need to go on the offensive, whether they want to or not. Sanders, the obvious leader of the Congressional opposition, has already taken up this challenge, hardly missing a beat since his campaign ended at the Democratic convention in July. It’s true that Sanders’ early statement that “if Mr. Trump has the guts to stand up to those corporations he will have an ally with me” was disconcerting. That’s because it’s impossible to endorse Trump’s populism without running the risk of also legitimizing his white ethno-nationalism. The two are inextricably linked: Trump’s populist program is for white workers only. But the Senator has since made it very clear that he will not collaborate with the administration. Sanders’ offer of an alliance was in fact a clever gambit: he was banking on Trump abandoning his populist campaign promises, and he was right. Richard Spencer and the alt-right agree. Trump has carried through on his promise of a Muslim ban and may yet build a border wall. But when it comes to cabinet appointments, the economy and social programs, it’s (so far) an entirely different story. Rather than “draining the swamp,” Trump has stocked his cabinet with swamp-dwelling billionaires, and Sanders’ early offer of a populist alliance now allows him to point to Trump’s hypocrisy and position himself as the true populist leader we need. He’s getting ahead of Trump by taking the lead on issues such as infrastructure and outsourcing that were central to Trump’s popular appeal in the hopes that he’ll be able to peel off Trump’s white working-class supporters and lead them back to a revived, class-based Democratic Party. There’s no way to know whether this strategy will succeed. Many very smart people are skeptical. But Sanders has a once-in-a-lifetime opportunity and he has to give it a go. If he fails, he should be ready to break with the Democrats for good. While they have tapped Sanders to head up their outreach, Democratic elites remain staunchly opposed to his efforts to transform the party. The likely Democratic presidential contenders in 2020 are dominated by Clinton look-alikes, including the staunch charter school advocate Corey Booker and Clinton protégé Kirsten Gillibrand (who, to her credit, has voted against more of Trump’s appointments than any other senator, including Sanders). But there are hopeful signs that Sanders’ efforts may not be in vain. While the two-party system isn’t going anywhere soon, parties do change. The Whigs collapsed in the 1850s when the Republican Party emerged to oppose the expansion of slavery. In the 1960s, Democrats’ support for civil rights led white southerners to abandon the party in favor of the Republicans. And in the 1980s we saw the emergence of “Reagan Democrats” on the right and the Demcoratc Leadership Council- and Clinton-led rightward shift in the Democratic Party that was intended to win them back. Perhaps nothing so dramatic is afoot today, but the Republicans have over the last several years moved toward the Tea Party right–with Trump’s election the most significant result of this rightward shift–and it may now be the Democrats’ turn to move to the left. Um, no, I guess we really didn’t think about that, that he was going to cancel [the Affordable Care Act] or change that or take it away. I guess I always just thought that it would be there. I was thinking that once it was made into a law that it could not be changed, but I guess it can? Yes? Not surprisingly, some liberals have mocked Mills, calling her stupid or saying that she and her family are getting what they deserve. Worse still was the widely-circulated post on Daily Kos that said we should “be happy for coal miners losing their health insurance. They’re getting exactly what they voted for.” This reaction isn’t just morally reprehensible; it’s profoundly counterproductive, reproducing the same elitist attitudes that alienated many white workers from the liberal establishment in the first place. Our goal shouldn’t be to shame these people but to convince them to join the anti-Trump opposition. Which brings us to perhaps the most important long-term work that we need to take up in the wake of the election: organizing the “deplorables.” This doesn’t mean making excuses for them or even offering empathy, just talking, listening, and trying to understand and convince. We need to persuade these Trump supporters that if we don’t let race-hatred break us up we can win and improve life for everyone. And history shows it can be done. 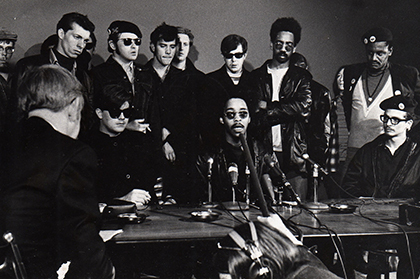 Members of the Young Patriots (including Hy Thurman) and the Black Panthers at an April 1969 news conference. Bob Zellner did it in Mississippi in the 1960s as a leader of SNCC’s Grassroots Organizing Work (GROW), a multi-racial project to organize poor whites, including Klan members, around their economic interests, and to challenge their racism in the process. So did Hy Thurman and the Young Patriots Organization, which in the ‘60s organized poor southern whites who had migrated to Chicago and worked with the Black Panthers and Young Lords to address common concerns: poverty, health care, child care, and policing. As early as the 1860s, Newton Knight led a successful rebellion of escaped slaves and poor Confederate deserters sick of fighting and dying for the planter class against the Confederacy in Jones County, Mississippi from 1863 to 1865. Other examples abound. Zellner, Thurman, and Knight were white–but they weren’t white saviors. Multi-racial coalitions are best but the white part of the coalition must be the responsibility of white organizers. Whites need to quit trying to organize in minority communities as “allies”–a practice that too often crowds out minority organizers from leadership positions–and instead look to our own house. That doesn’t mean we should shy away from working to support minority organizers and their organizations. But we must recognize that too many of us are doing this work and too few are organizing in our own communities. The unions have a critical role to play in this work. Only they have the organizational resources–including armies of organizers–to do it. They can start by educating their existing white members around race and the need to organize across race lines. Whatever they have done so far has been insufficient. Despite a mighty effort to turn out their members for Clinton, 43 percent of members of union households voted for Trump. Race ought to be a regular topic in every union newspaper; at every union meeting; and in every organizing conversation. But the unions represent a measly 10.7 percent of American workers. Even the best educational effort won’t make a difference if they don’t extend their reach among conservative whites in non-union areas. Fortunately, there’s a model for this type of mass union organizing: Operation Dixie, the CIO’s campaign in the late 1940s to organize the South. Dixie failed for a variety of reasons, including red-baiting and the purge of radicals from the unions in the late 1940s, and a second attempt won’t be easy, but it has to be done. The labor and progressive movements’ survival depends on it. While its goal isn’t necessarily to organize workers into unions, the SEIU-backed Fight for $15 provides a good starting point for contemporary efforts. Fight for $15 has so far focused on organizing low-wage workers in urban areas to push for increases to local and state minimum wages but the campaign is now looking to expand its coalition to include working-class Trump voters who have lost the blue-collar factory jobs on which they once depended. If it succeeds, it will be well-poised to tackle the racism that divides the working class. Small groups can do this work too. The International Socialists, which emerged from the ‘60s student movement, became known on the left for sending members to take industrial jobs in key unionized workplaces in an effort to push the unions to the left [editor’s note: the IS was one the groups that eventually merged to form Solidarity]. They weren’t the only ones but they were some of the best, especially inside the Teamsters, where their efforts led to the formation of Teamsters for a Democratic Union (TDU), which exists to this day. TDU mostly sticks to bread and butter workplace issues, only obliquely addressing broader social concerns, but there’s no reason the IS model of deep-rooted organizing can’t be adapted to tackle race head-on, in the workplace and the community. Following in the footsteps of organizations like SNCC and organizers like Zellner, white radicals who might have planted themselves in industrial unions in large cities in the 1970s can today do the same in poor white communities instead. It’s hard work but important–far more important than engaging in sideshow street battles with the alt-right, the recent debate over which has unfortunately detracted from more serious conversations about organizing. Very few will do this work but we’ll all owe those who do a great debt of gratitude. Micah Landau is a graduate student and longtime union staffer in New York. He is a member of the New Politics editorial board and sympathizer of Solidarity.